It is with great pleasure I write this letter of recommendation for Mr. Zeb Bell of Murtaugh, Idaho. 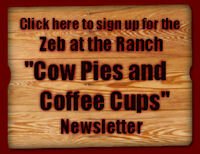 Zeb has worked for AQHA as an announcer at the AQHA World Championship Show, the most prestigious show of the World's largest equine breed, since 1989. in 2001, he was able to announce the AQHYA World Championship Show, the largest youth equine organization championship, for the first time. We had tried to hire Zeb for years for the AQHYA World Championship Show, but schedule conflicts have prevented him from being able to do so. Zeb has worked as an announcer for AQHA longer than any other announcer. His long tenure with AQHA can be contributed to his professionalism, as well as, his excellent voice. To me, Zeb is a true friend, and a pleasure to work and be associated with. i would recommend him to anyone who is looking for a first class announcer. Just a note of thanks for a great job of entertaining and informing our guests at our annual "Ag Appreciation" dinner. You brought laughs to their hearts and tears to their eyes and made them feel good about themselves and about us. I have had many positive comments from our clients thanking me for bringing you to the dinner and asking if we will have you back in the future as they really felt they gained something from listening to you speak. Rest assured you made the evening a huge success for us and if I can ever be of any assistance please give me a call. Thanks again for a great job. I am pleased to write a letter of reference for Zeb Bell. I have known Zeb for five years and have had the opportunity to utilize his expertise in radio broadcasting for the past two years. I am currently the Athletic Director at Murtaugh High School and am beginning my third year as the Head Boys Basketball Coach. For the past two years, Murtaugh has been fortunate enough to qualify for the State Boys Basketball Tournament. Both years Zeb served as the link between the Boise and Magic Valley by broadcasting or games via KBAR Radio. Even though Zeb benchmarked the entire project, many patrons expressed their thanks to me, and they were very complimentary toward the quality of the broadcast. Having taped and listed to the games myself, I was very impressed by his ability to deliver a play by play description of the games. Besides being able to call a great game, Zeb had taken the time to learn about each player and what they do off the floor, so that he could interject interesting facts whenever the opportunity came up. Zeb definitely has the unique talent of helping people "see it on the radio". As you know, along with putting games on the radio, comes the task of finding sponsors. I was very impressed with the contact and network of people Zeb has in the Magic Valley. After the decision was made to broadcast the games, Zeb took it upon himself to find all the sponsors and he found them in less than a day. On a personal note, one of the things that have impressed me most about Zeb is his genuine concern for what is happening in the Magic Valley. I can't help but smile when I think that even with all of the professional broadcasting experience Zeb has, he still made time for putting Murtaugh and Oakley games on the radio. It is without reservation that I recommend Zeb Bell for any broadcasting venture as he is a proven professional. If you have any questions, I can usually be reached at 432-5451(day) or 432-5343(evenings).